GSMArena released a post recently about the most popular smartphones in 2013, 2014 and even presently at the moment. The statistics in the post was provided by the popular benchmarking Application maker - AnTuTu. AnTuTu compiled statistics from their AnTuTu Benchmark App to try and paint a picture of the global popularity of Android phones and the results show Samsung and Google Nexus have a huge presence and unexpectedly, Xiaomi. Honestly, I've not even seen someone using this phone before. Although, 50% of the info in the statistics above came from users based in China but it still provides a better view of which Phone is the most popular worldwide since the number of individuals in China alone is even more than the number of people in some continents. 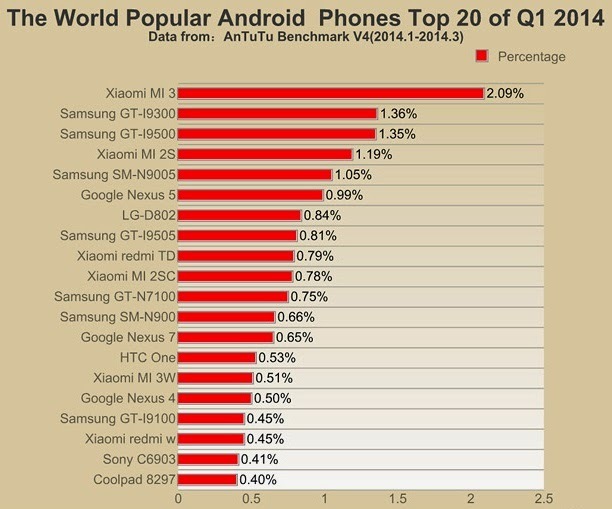 No wonder according to AnTuTu usage, the Xiaomi MI 3 is the most popular phone worldwide. The Samsung Galaxy S5 (Exynos) has almost caught up with the Galaxy S III (which is in second place). Note that the Galaxy S5 (Snapdragon) is listed separately. 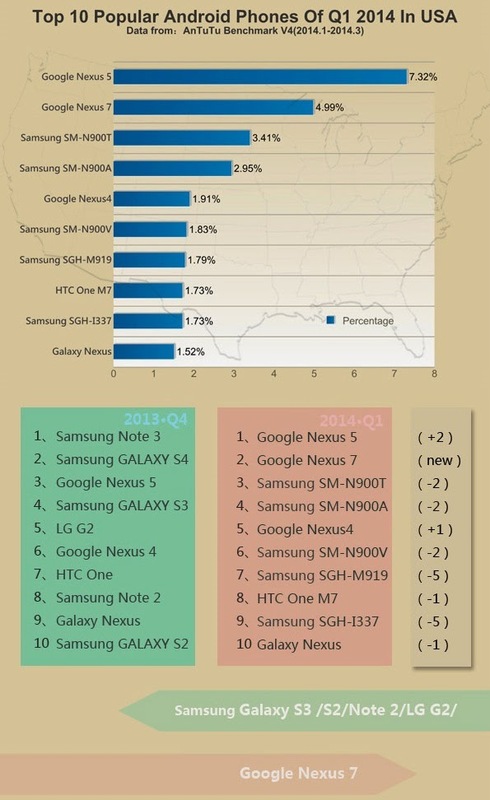 The statistics for the United States place the Google Nexus 5 leapfrogging the most popular Galaxy Note 3 version and ending up in first place. All the three versions of Note 3 in the US, however, still add up to more benchmark runs than the Nexus 5. The Google Nexus 7 tablet is the second most popular individual device on the list. Again, don't forget that this data seems heavily skewed towards China & Asian markets in general and even the US readings might not be 100% accurate cuz I've been wondering if the Google Nexus 5 is really that popular. Or what do you think ?? ?